Swimming, Rodeo, Museums, and Camping add excitement to our park. Official Wood Mountain Regional Park Website is at www.woodmountainpark.ca. The park is located 5 minutes south of town. For camping you can choose a forest setting for you tent, or a roomier space for your camper with electricity and water easily available. On those hot days you can go for a dip in our heated 20m outdoor pool (Pool being renovated in 2009; contact the park for details). The water is guarded by experienced lifeguards, and has a diving board. There is a separate paddling pool for little children. Lessons are taught Summer weekday mornings, and the public can swim in the afternoons and evenings all week. Season passes and daily rates are available. Church Camp Woodboia offers youth a fun summertime activity. There are two ball diamonds in the north-east corner of the park. The park is a good site for family reunions, because of the spacious campsites, and family activities available. The park has a hall for gatherings and also a booth with confectionery goods and meals. If you want to eat or cook indoors, a summer kitchen is available for use. There are also laundry, shower, and trailer facilities. During the second weekend every July, you can catch the Wood Mountain Stampede. There are many other events to take in at the park, including Cowboy Poetry gatherings. Call Thelma P. at 306-266-4750 for information on Cowboy Poetry. The Rodeo Ranch Museum has many artifacts and displays of cowboy life, including the history of the Wood Mountain Stampede. Information on Grasslands National Park is available in the Museum. 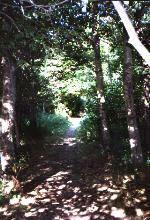 The Wood Mountain Historic Park is a short, scenic walk along a cut path from the Regional Park. A section of the path is shown here. Have a look at our map of the parks and the area. A monument to Sitting Bull is atop a hill on the park grounds, visible from the pool. To have access to the park facilities, you can either buy a transferable Regional Park 2008 pass for $30.00 or a day pass for $10.00 . The season pass is good at any Saskatchewan Regional Park such as Thompson Lake Regional Park north of Lafleche. Thompson Lake is an hour's drive away, and has a golf course with grass greens. For more information contact Tourism Saskatchewan or email us.